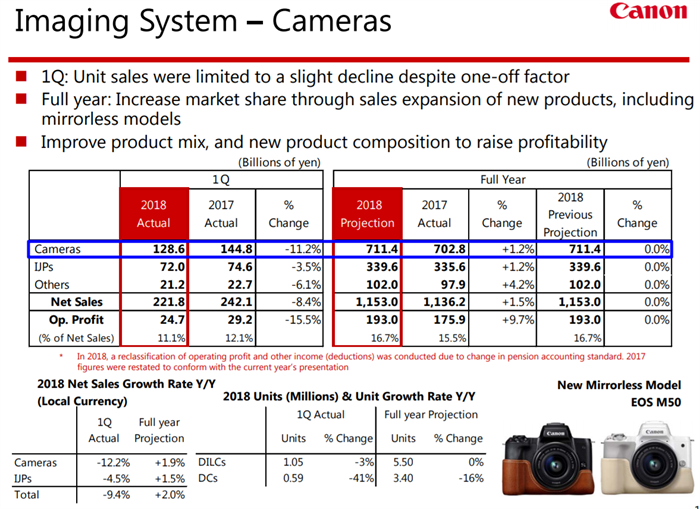 Canon released their first quarter 2018 results and the results were fairly impressive overall for the company however imaging overall has taking a bit of a hit from 2017 for the imaging division overall, not particularly for the ILC area which usually concerns us the most. Their unit sales for ILC fell a minor amount by 3% much of that due to the fact that Canon for ILC's didn't suffer through the Kumamoto earthquake as they make all their own sensors at fabrication plants far away from there. In the first quarter, although unit sales in the same period last year were at a high level, resulting from the resolution of shortages that arose following the Kumamoto earthquake in 2016, we posted 1.05 million in unit sales, limiting our decline to 3%. This is a key takeaway from Canon's message to investors about what really we have to look forward to, it certainly sounds like canon is going to launch more and more high end amateur models (Think 7D Mark III, full frame mirrorless as possible options here). Canon also wants to continue their automation plans which is already impressive to increase their industry leading profit percentage. From a profit perspective, by raising the proportion of sales generated by new products and solidly expanding sales of high amateur models, we will improve product mix. We will also work to improve profitability by further expanding our use of automation for production and through efforts to thoroughly optimize expense management. Canon for the first half this year will be hard pressed to hit the same numbers as last year, simply because of sales that were gained because of the earthquake, what will be interesting is do they hit their target of 5.5 million units for the overall year, and continue to be the market leader by a significant margin. New products coming out this year will give us an idea on how Canon is going to tackle the now suddenly very competitive high end amateur market.